As a culture, we tell stories about single people, women in particular. Who among us has not heard cracks about crazy cat ladies, who, when living in New York, may die alone, undiscovered until the smell drifts into the hall, alerting not the neighbors, but the police, or building management. I have long thought that it would be much worse to die with cats than alone. I have been part of telling these stories over myself. One of my co-workers has been known to add "and you're going to die alone, we know," to the end of one of the dramatic statements I have been known to make. Even though I don't believe that these stereotypical comments are reflective of reality, it's hard to get away from them, even in my own mind. I am frequently thankful for my cat allergy, which has permanently silenced those who have asked when I will start collecting cats. Even though I am pleasantly placed in an interesting career, a cozy home and many meaningful relationships, in short, a lovely life, I find myself bemoaning my singleness far more often than I would like. I don't want to deny my desire for romance and companionship. But there is a difference, for me, between acknowledging my hopes and discounting the beauty and richness of my life now. These are not "starter blessings." Last Friday, I was plopped into the middle of a stereotype. I was getting ready to leave work after a busy week, trying to tie up loose ends to allow me to take Monday off (as this post wings it's way into the world, I am in Colorado, speaking to English majors about writing). 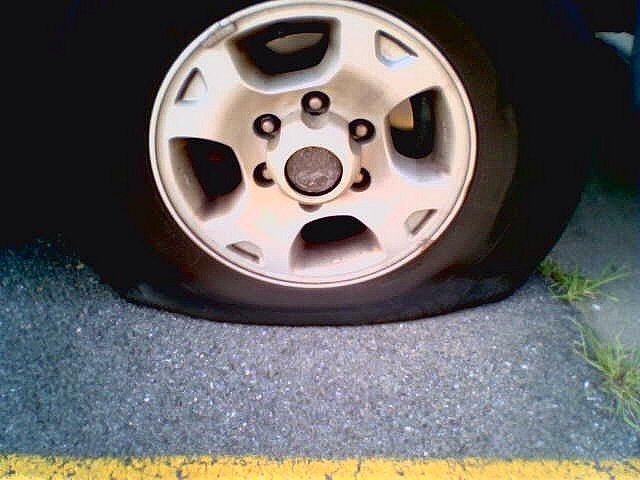 A co-worker came back into the office, shortly after leaving, to tell me that one of my tires was flat. I went out to inspect it, not wanting to believe it, and walked back inside to call my mom. She suggested that I head to a gas station for a little air, before making my slow way to nearby Costco for a good look. When I was in driver's ed, we had to learn how to change a tire. An older friend, likely about the age I am now, helped me to go through the motions. Quite a few years have passed since then and I have no real memory of that time, other than relief that the requirement was at an end. I have kept the roadside assistance on my insurance plan current. I pulled up to the gas station and reluctantly put four quarters into the machine to start the air flowing. The picture on the front assured me that part of my money was going to help hungry children. It was raining. I struggled with the hose, unable to get much air into my tire. When it didn't seem so dangerously low, I capped the valve and began my journey to Costco. The temptation was there, of course, to start crying on the way. Here I was in the situation I'd laughed about so many times before. I was the single girl with the flat tire, driving through the rain, wishing for rescue. I had an event to get to that evening. I would likely be late. There is no shame in tears, I know, but something in me hardened and clicked into place. I would not be that stereotypical single woman, I told myself. This would be all right. This was not too much. I began to unclench my fingers from the steering wheel. I arrived at Costco and handed over my keys. I started to wander around the warehouse, picking up beautifully illustrated copies of Anne of Green Gables and Little Women. Christmas was in the air and the gifts were out in full force. Soon, I was summoned back to the tire center. "What was the problem?" I asked, thankful that I hadn't needed a whole new tire. "The valve was leaking," the mechanic told me. "We replaced it for you." I drove home, on four full tires, thinking of the tears I didn't cry and the hope I sometimes struggle to keep alive. It's amazing how often valves begin to leak.